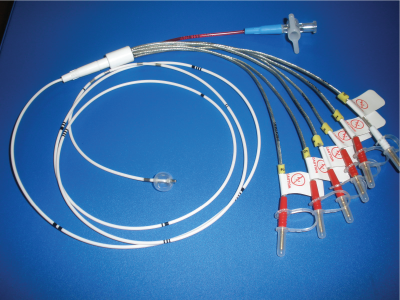 The Hexapolar Electrode Balloon Flotation Catheter is made of extruded radiopaque polymeric tubing with two lumens and six stainless steel electrodes. The Hexapolar Balloon Pacing Catheter is made of extruded radiopaque polymeric tubing with two lumens and six stainless steel electrodes. Electrode spacing is shown in the above table on electrode measured from distal tip, depending upon which model you choose. Each catheter is packaged in a sterile peel-pack tray. Each catheter has clear, easy to identify increment markings every 10 cm along catheter body.